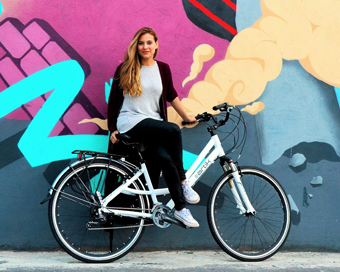 Artik Bikes, an Irish brand, has created and launched a range of electric bikes. The range includes road bikes, city bikes and mountain bikes which can be used with either electric assistance or manual pedalling which is very easy due to the lightness of the bikes. The company’s 2016 Diamond Line of e-bikes are feather light, in comparison to conventional e-bikes, and their most notable feature is that the battery and engine are completely concealed within the bike’s frame, unlike previous e-bikes which have been available in the Irish market. Artik Bike’s managing director, Annie Aragón (pictured), said: “We combine cutting edge technology with a classic retro design. Our innovative range has been perfected by expert engineers who focused on equipping the bikes with the most advanced technology. Our aim is to push the boundaries of technology to improve our customer’s cycling experience so that everyone can get fit and discover their athletic side”. She continued: “Take the mountain bike as an example. Many people would like to take part in this activity but are not sure if they are fit enough to do so. Our mountain e-bike can allow you to explore winding country roads or mountain routes with little effort to begin with and you also get the benefits from enjoying nature in its purest form”.